Before we dive too deeply into this, understand that Best Buy is wrong A LOT of the time. They were telling employees that Ice Cream Sandwich updates were coming to the Rezound and RAZR back in early April, and yeah, owners of those phones know exactly how that panned out. They also tend to populate their systems with dates that look more like estimates than anything official. With that said, they do give us good info from time to time, so we thought we would at least share. 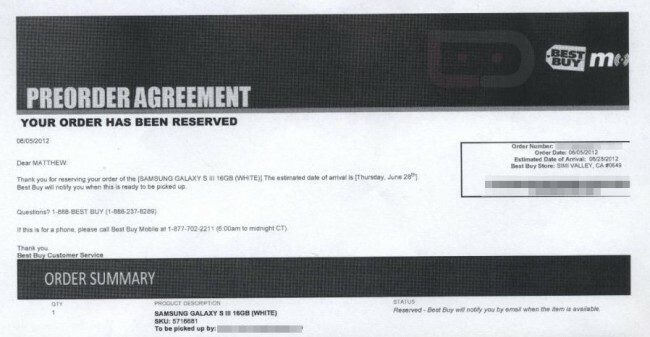 If you pre-order the Verizon version of Galaxy SIII from BBY, they are apparently telling customers that the device could arrive in stores by Thursday, June 28. There are a couple of reasons we like this date: 1. It’s a Thursday and Verizon likes launching phones on Thursdays. 2. We were told by a source that Verizon expects to have the device at warehouses as early as June 23. If that’s the case, then the 28th is certainly a possibility. Again, Best Buy is hit or miss with this stuff, so don’t take it as gospel, just file it away into a “potential” locker. If you pre-order directly from Verizon, they are telling customers to expect it by July 9.